Lie: Expanding oil and gas pipelines is consistent with meeting climate targets: Of all the assertions, this is by far the most questionable. Many people find it deeply insulting to their intelligence. This Government, elected on a promise to curb carbon emissions, has approved 3 oil pipelines, a dozen LNG plants and a plethora of coal shipments, all of which runs counter to any discernible plan, other than an anemic carbon tax proposal, to curb emissions. Failure to take any action against the fossil-fuel industry – the source of at least half of our emissions – is more reminiscent of the Harper era than the “real change” and reduced oil subsidies we were promised. Lie: Getting Kinder Morgan’s TMX built is “in the national interest”: Serving Canadians better is certainly “in the national interest”. To argue that bailing out a dodgy Texan oilco with $4.5 Billion of Canadian taxpayer dollars outranks getting affordable housing built, educating our workers for industries of the future, improving access to health care and getting clean water to First Nations reserves shows a profound misconception of the concept of “national interest”. Lie: We are missing out on getting a higher price in Asia for our oil: This is not, nor has it ever been, a provable assertion. Instead, the evidence shows that heavy oils like Alberta’s tarry goop sell for a discount from U.S. prices in Asia. Small wonder then that none of the oil from the existing pipeline goes to Asia – the tankers all turn South to the U.S. That’s odd – surely some would go to Asia if there were a better price to be had there. Lie: The project will generate 15,000 good, middle-class jobs: Wish that it were so! Unfortunately, Kinder Morgan’s own figures show only 52 long-term jobs in BC associated with the TMX project- running the expanded Burnaby tank farm, the terminal and maintaining the pipeline. There are more employees in an average tourist hotel. All others – digging and laying the pipeline, feeding and housing the workers – would be temporary workers during the 2-year construction period. And there are dozens of hungry pipe-laying crews in Texas and Oklahoma all geared to fill those construction jobs. Lie: We have no more important relationship than that with First Nations: Mouthing frothy apologies for 151 years of cruel mistreatment and promising to ratify UNDRIP (the United Nations Declaration on the Rights of Indigenous Peoples), doesn’t cut the mustard with First Nations. They know that old colonial attitudes remain deeply embedded in the loathsome Indian Act. Offering them a way out of grinding poverty if only they will agree to a dangerous pipeline serving a sunset industry – shameful! Lie: The Ocean Protection Plan will protect against oil spills on the coast; The Feds say that “their” science says diluted bitumen floats (so no need to worry). It didn’t in the 2010 Michigan spill. Eight years later, bitumen is still being scraped off the bottom of the Kalamazoo River. And, even if it did float, at best 10-20% of the spill will be recovered. The rest of it will end up on the riverbed or ocean floor or wash up as tar-balls on our beaches. The bottom line is that all of the $1.5 Billion of vaguely defined Oceans Protection Plan won’t make dilbit float. Lie: There are investors lined up to take this off the Government’s hands: Alas- no. Neither Enbridge (trying to reduce debt on its books) nor TransCanada (busy with Keystone XL) showed the slightest interest in taking on this deadbeat project. Some pension funds showed vague interest as investors, but their pipeline know-how ranks below even that of the Federal Government. It is likely that taxpayers will be stuck with this for a long time. That is odd – didn’t the West react unpleasantly the last time a Trudeau wanted to nationalize Alberta’s oil industry? Lie: Kinder Morgan has spill insurance: Well – not really! As economist and former ICBC CEO Robyn Allan explained, Kinder Morgan (U.S.) baulked at the NEB’s insistence that it set aside a hefty insurance fund for spills. 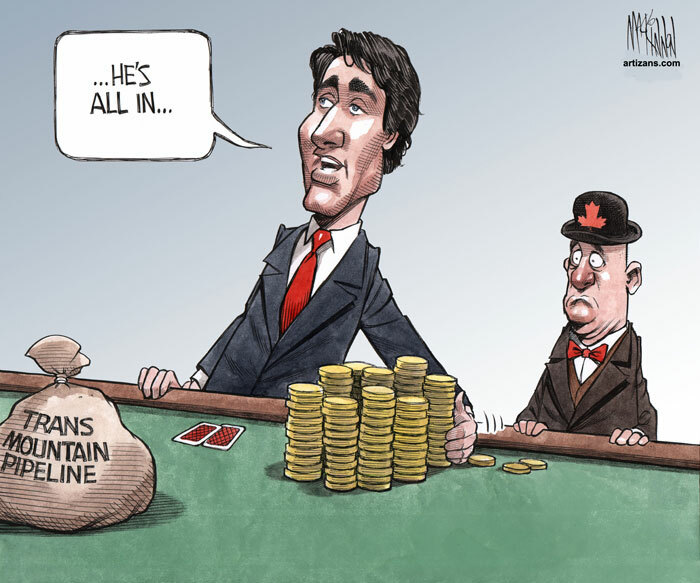 The Federal Government – yes, the same Feds/politicians that paid billions of public money to settle the Nathan E Stewart, Marathassa, Mount Polley and Lac Megantic disasters – have now stepped in to put taxpayers on the hook for spills from TMX’s pipelines and tankers. Abraham Lincoln famously said “You can fool all the people some of the time, some of the people all of the time, but never all the people all of the time”. Face it – TMX is an economic basket-case. Eoin Finn B.Sc., Ph.D., MBA, is a resident of Vancouver and a retired Partner of Accounting/Consulting firm KPMG. After 35 years in the business world, he describes himself as an “accidental activist”. Update (October 19, 2018): A barrel of Western Canada Select (“dilbit”) now fetches US$22 on the U.S. market ($6-$8 less than that in Asia). 30% of that barrel, costing US$18, is the condensate required to thin the viscous bitumen goo so that it can be pumped through a pipeline. That leaves dilbit producers earning $4 for every barrel- way less than required to cover their costs.